Thank you for your lovely picture. 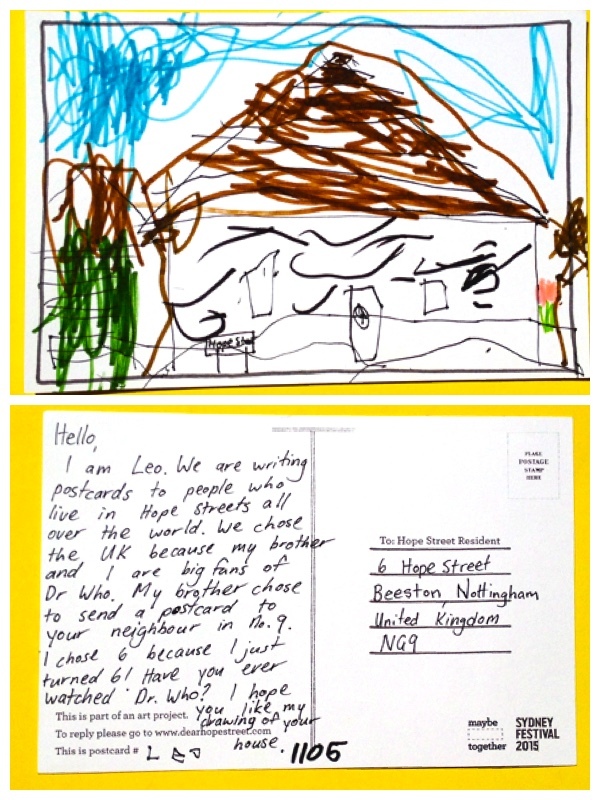 What a wonderful idea to send cards to people in the Hope Streets all over the world. I’m glad you like Dr. Who. I have liked this programme for a very long time. I hope you will continue to enjoy it. We are quite cold here at the moment. I expect you are having warm weather. Thought you might like to know that the Nottingham Post (Newspaper) heard of all the postcards arriving and came to interview people on Hope Street, and take photos of the postcards. There was an item in the paper about the postcards a few days ago. How exciting! Today when I was cleaning up I found the little code and went online to find out if there was any response. What a delight to find that you received the card and you responded so quickly. By now your weather will be warming up and we have dragged out our scarves and coats. We would love to see any images of the newspaper report. My favourite Dr is Matt Smith. My mum and dad both like Tom Baker. My brother Archer can’t decide between the two. Who is yours?